Nikki Haley received a surprise text at the United Nations. It allegedly said, “Thank you for what you said today. It’s so good to see America lead.” I’m not surprised she got that text. For all I know, that could have been Israel sending it, but it is indeed good to see actual leadership in America again. I know that many Trump supporters don’t agree with me. They claim we should not be the global police and should not interfere in other country’s affairs. I’ve got news for all of you… what happens globally affects America period. You may not want conflict or war, but other countries don’t give a damn about that. You may not believe in war, but it believes in us. We have waited years for various gassing attacks in Syria to be investigated and for the United Nations to do something, anything and we are still waiting. I think that what President Trump did this week was the right thing to do and it sent not only Syria, but Russia, Iran, China and North Korea a strong message that there is a new sheriff in town and he doesn’t play with red lines and rhetoric. He’s deadly serious about stopping our enemies and have no doubt that Syria, Russia, Iran, China and North Korea are just that… American enemies. Grow up… this isn’t some theoretical reality where we can just turn our back on the world. This is real life and we have to stop these evil blackhats before they attack America. Hesitation is viewed as weakness and acquiescence. U.S. Ambassador Nikki Haley boldly confronted Russia and Syria during a United Nations Security Council meeting on Wednesday, staring down the Russian ambassador in moment that went viral. “How many more children have to die before Russia cares?” she asked the Russian ambassador in front of the world. Later that night, Haley made an appearance at the Women in the World Summit in New York City and revealed the text message she subsequently received from another member of the U.N. Security Council. “Thank you for what you said today. It’s so good to see America lead,” the text reportedly read. There is nothing that will move a heart like watching dozens of children… babies… die horrifically. Assad and the Russians could care less. Given the opportunity, they would use that tactic anywhere they land if it won them power, wealth, real estate and natural resources. Nikki Haley is right here. It is long past time we act like the world leaders we are. No nation building… but when tyrants kill the innocent and rage unabated and someone needs to step in, we have a moral obligation to do so. And we have a military presence that should show strength, not the cowardice the Obama administration mandated. “The way you lead is to make sure they know what you’re for, they know what you’re against, and they never question where you are,” Haley added. Exactly right. You actually LEAD, you don’t vacillate. 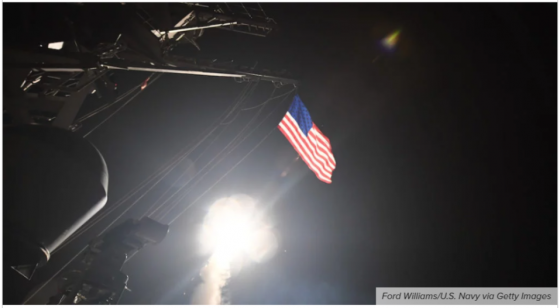 President Trump’s actions this week in response to a chemical attack by Assad against his own, shows a definitive shift in America military policy. And don’t say, “Well, it could have been the rebels!” No, it wasn’t. They would have no way of dispersing those chemical agents since they don’t have planes and Assad and Russia always blame these actions on their victims. It’s right out of their playbooks. Our allies are cheering the action and breathing a huge sigh of relief. Our enemies are calling it an act of aggression. It’s an act as old as time. But President Trump is no ‘lead from behind’ president as Barack Obama was. Peace through strength has once again taken center stage.